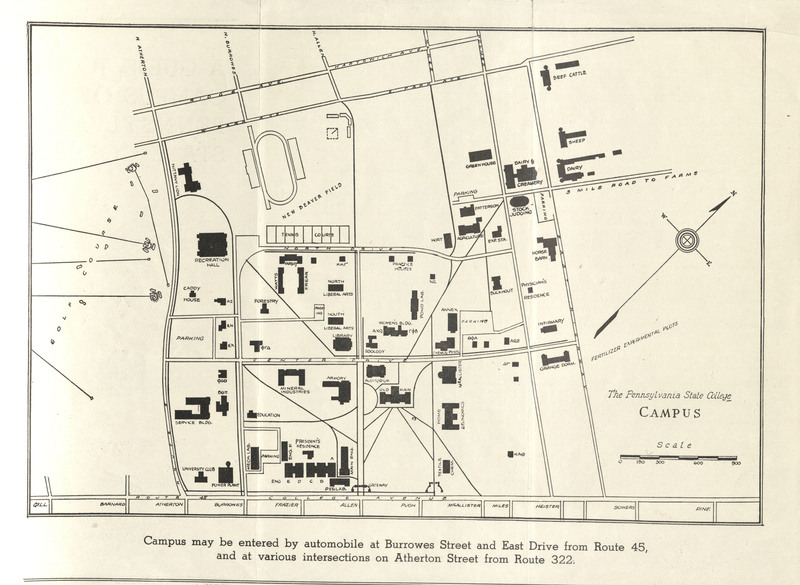 The history of the University Park campus including and the Nittany Lion and the building and landmark archive. 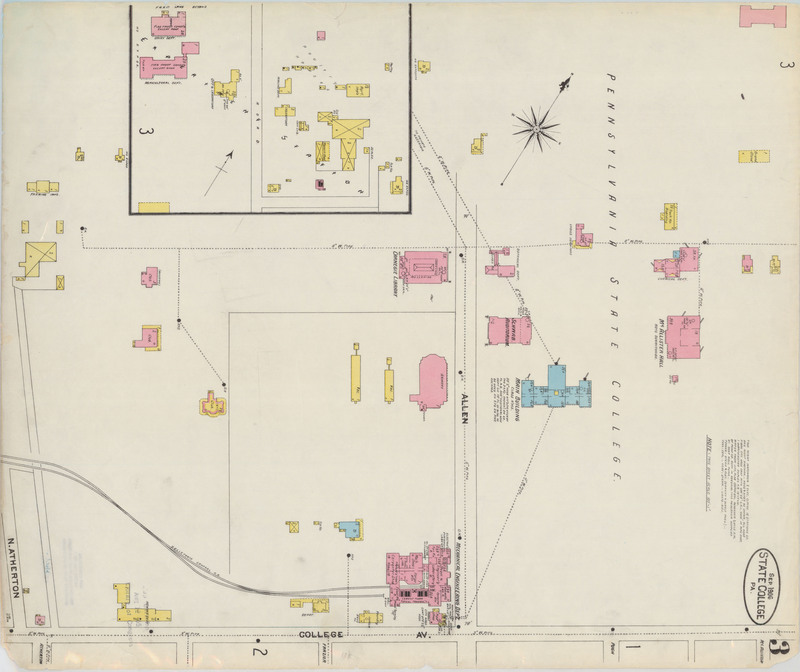 A web map of Sanborn Fire Insurance maps from 1906, 1911, 1922, and 1929 shows how campus and town changed over time. 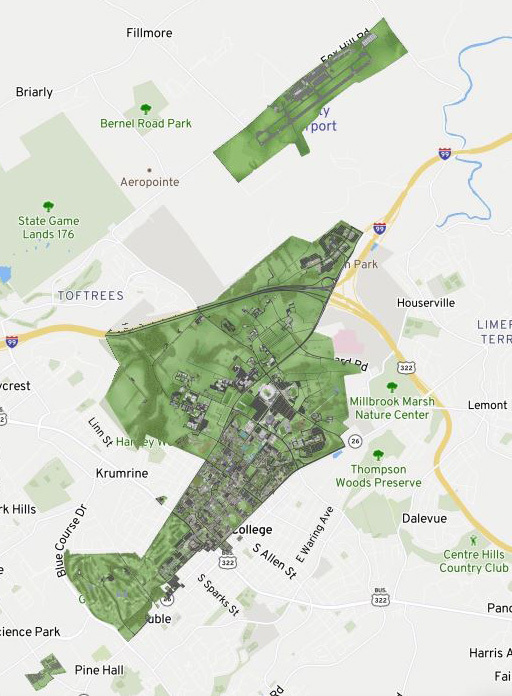 The State College Change Through Time project took the initial steps of georeferencing and mosaicing the scanned maps. 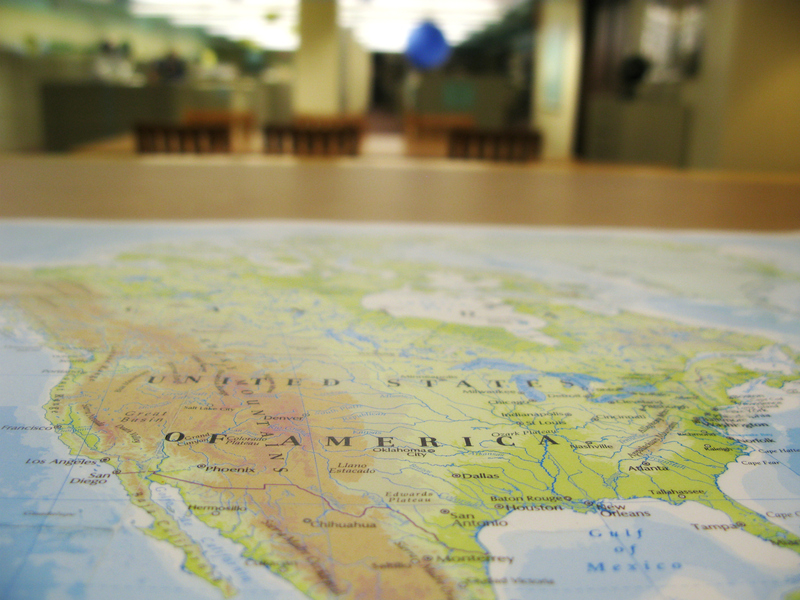 Information about the 4,000 buildings was extracted by hand using ArcGIS Desktop. 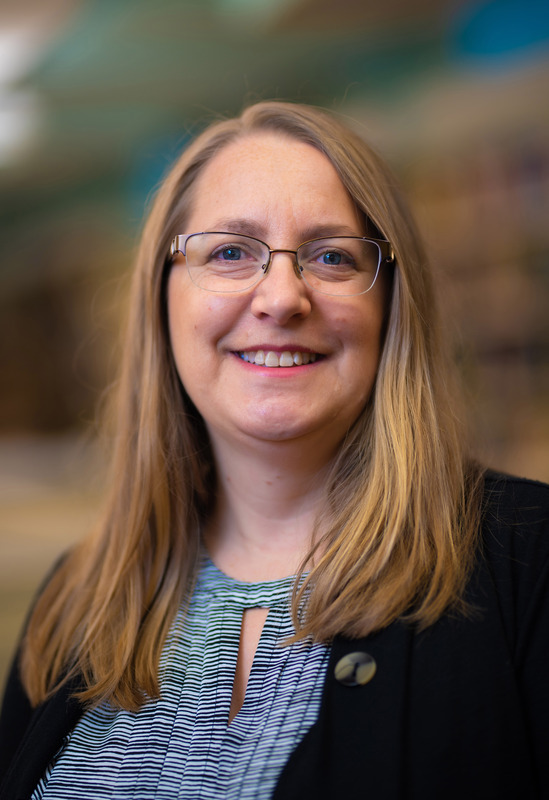 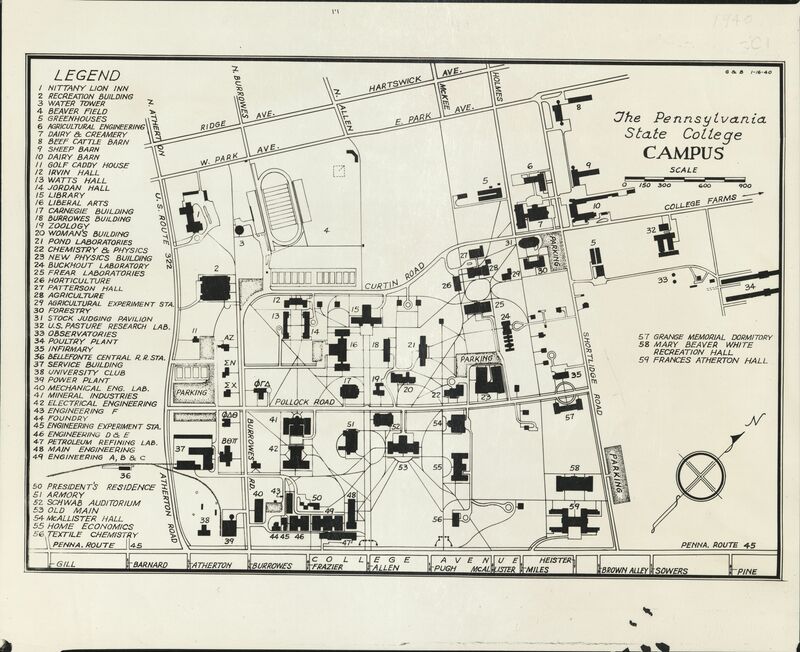 Historical photographs from Penn State’s Eberly Family Special Collections Library were linked to individual buildings for each time-period where available to give context to the map and to also make these resources geographically discoverable. 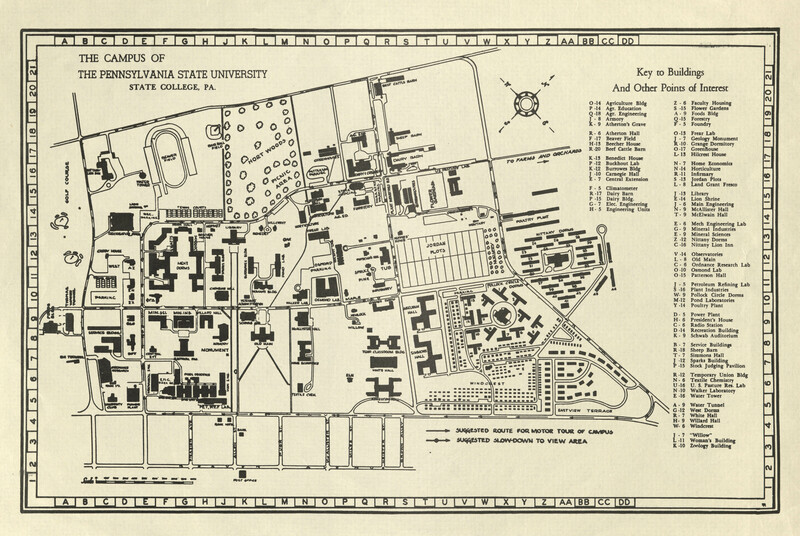 Advertisements for local businesses were harvested from historical publications and linked to the buildings that businesses once occupied. 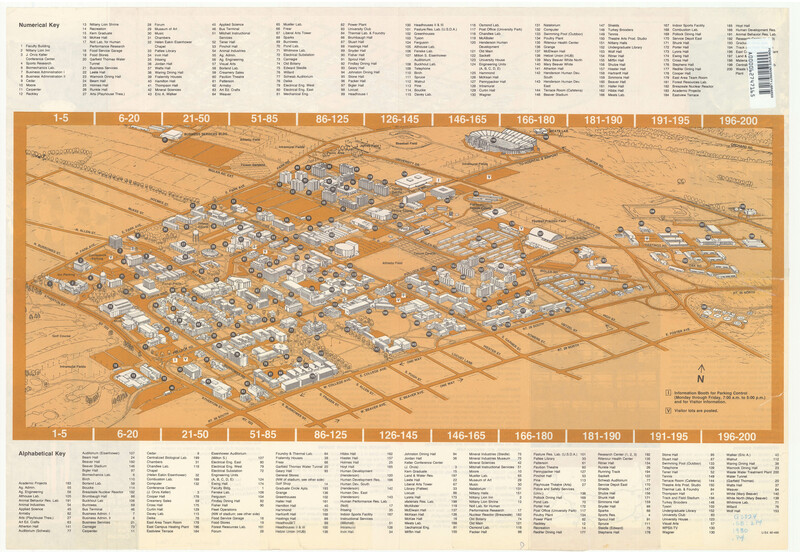 When brought together in this map series, these resources paint an interactive and vivid picture of what campus and town were like, and the dynamic growth that Penn State and State College experienced during the early part of the 20th Century. 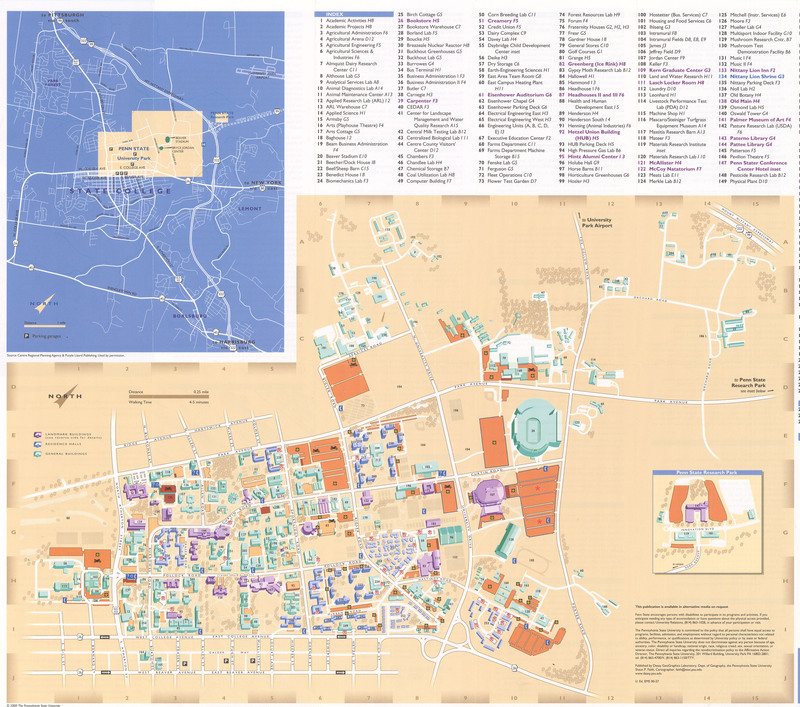 These maps also provide data about campus and town in geographic context that can be repurposed for other research goals. 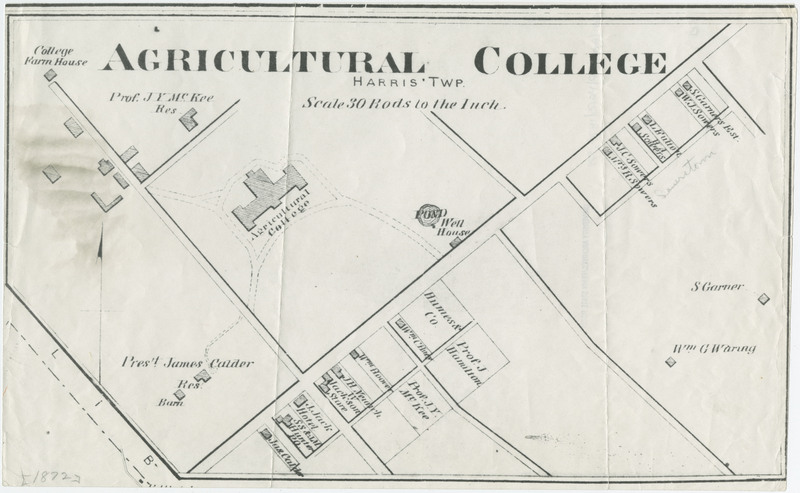 "Map of Agricultural college," Atlas of Centre County, Pennsylvania: from actual surveys by Beach Nichols, The Eberly Family Special Collections Library, Pennsylvania State University Libraries. 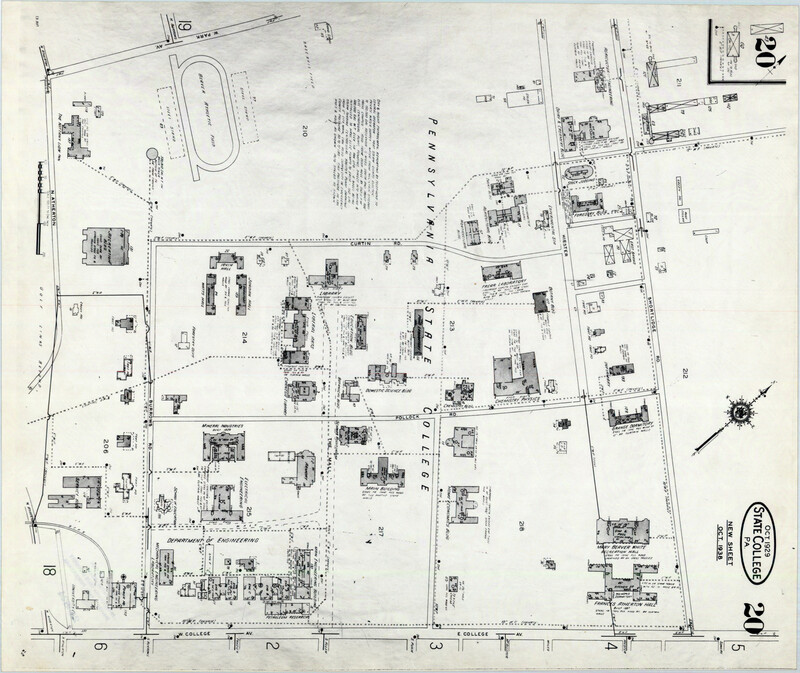 “Map of Campus,” General vertical files, Physical Plant: file: Maps and Charts, 1874-1929, The Eberly Family Special Collections Library, Pennsylvania State University Libraries. 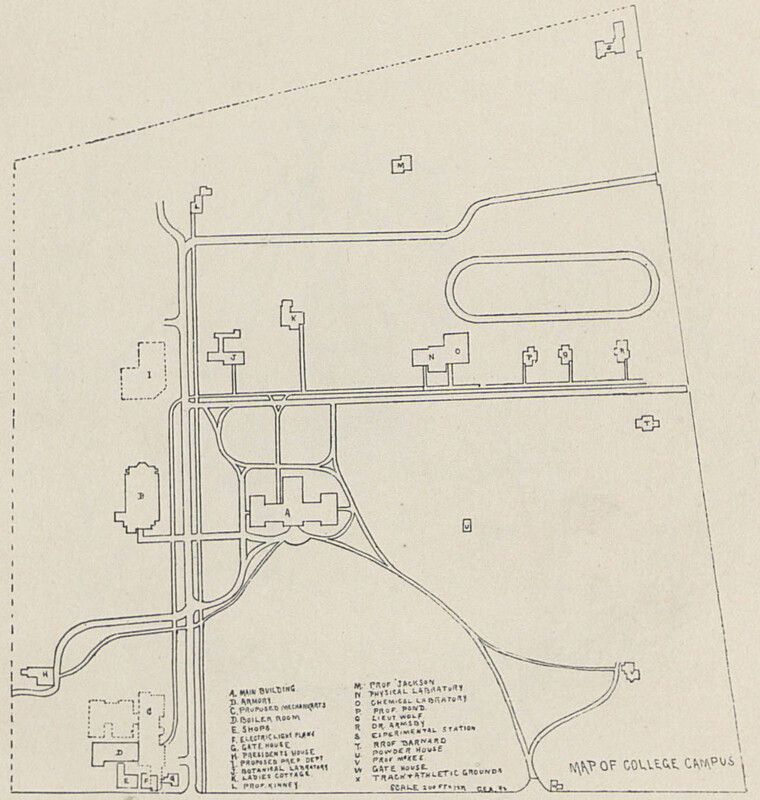 “Map of College Campus,” From 1892 LaVie, page 35,The Eberly Family Special Collections Library, Pennsylvania State University Libraries. 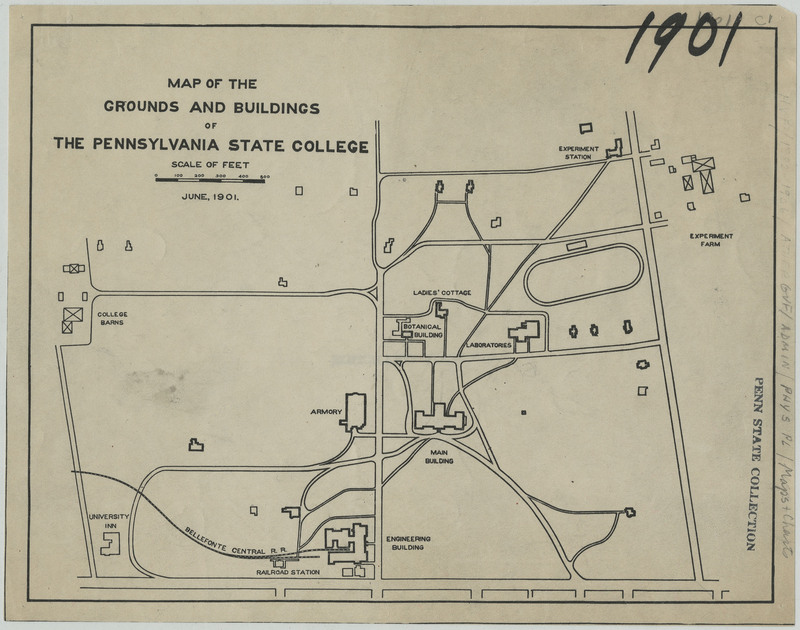 “Map of the Grounds and Buildings of The Pennsylvania State College,” The Eberly Family Special Collections Library, Pennsylvania State University Libraries. 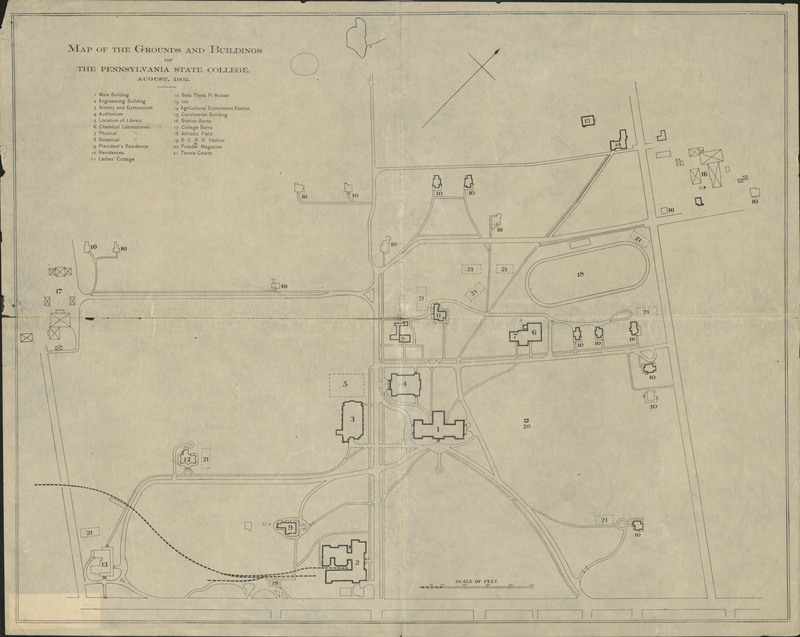 “Map of the grounds and buildings of the Pennsylvania State College, August 1902,” General vertical files, Physical Plant: file: Maps and Charts, 1874-1929, The Eberly Family Special Collections Library, Pennsylvania State University Libraries. 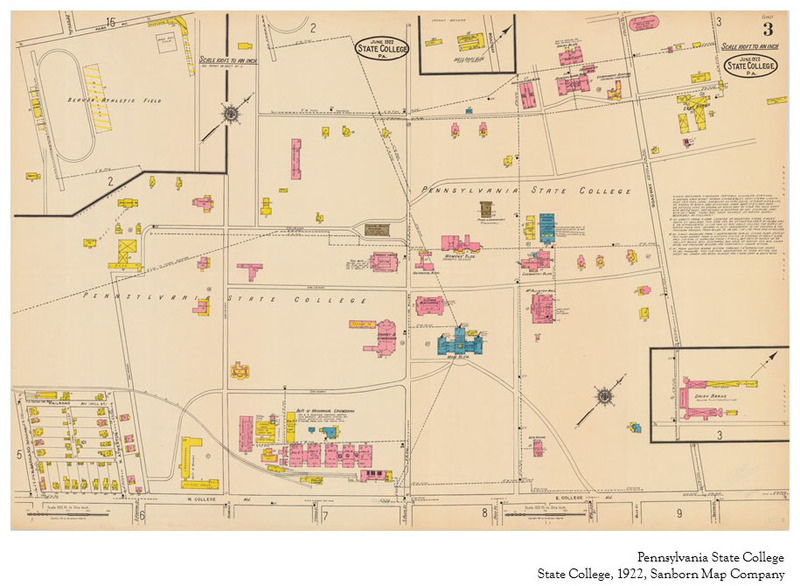 “State College, Centre County, Pennsylvania, September 1906,” by Sanborn Map Company, Donald W. Hamer Center for Maps and Geospatial Information, Pennsylvania State University Libraries. 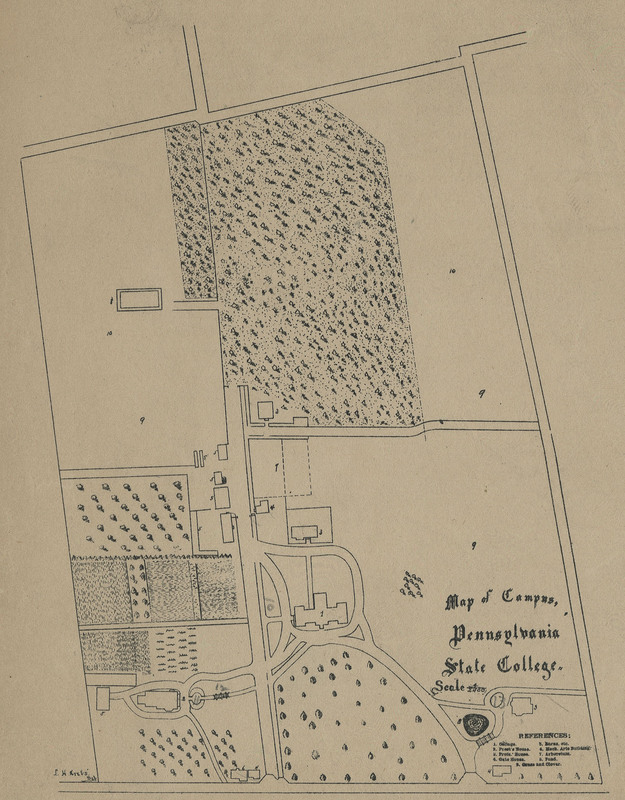 “Campus and Experimental Farms of the Penna State College,” The Eberly Family Special Collections Library, Pennsylvania State University Libraries. 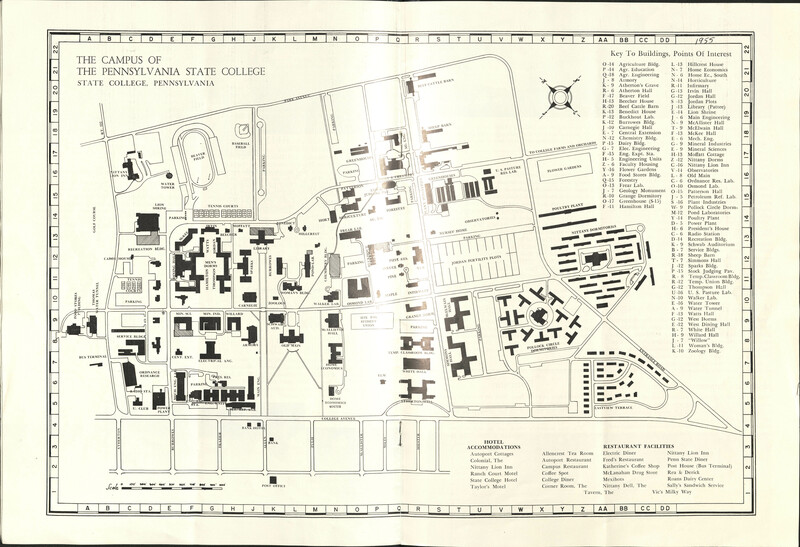 “State College, Centre County, Pennsylvania, Oct. 1929,” by Sanborn Map Company, Donald W. Hamer Center for Maps and Geospatial Information, Pennsylvania State University Libraries. 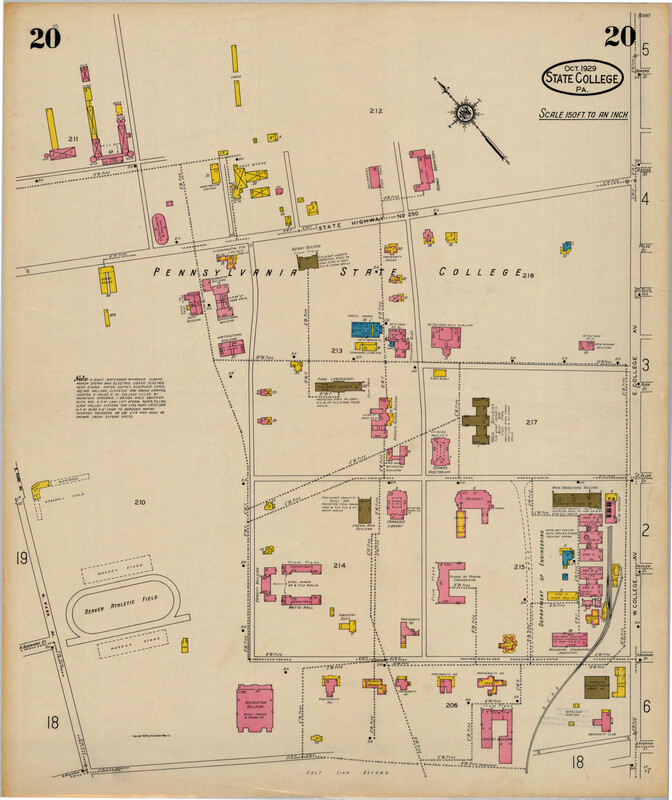 “Pennsylvania State College Campus,” General vertical files, Physical Plant: file: Maps and Charts, 1930-1939, The Eberly Family Special Collections Library, Pennsylvania State University Libraries. 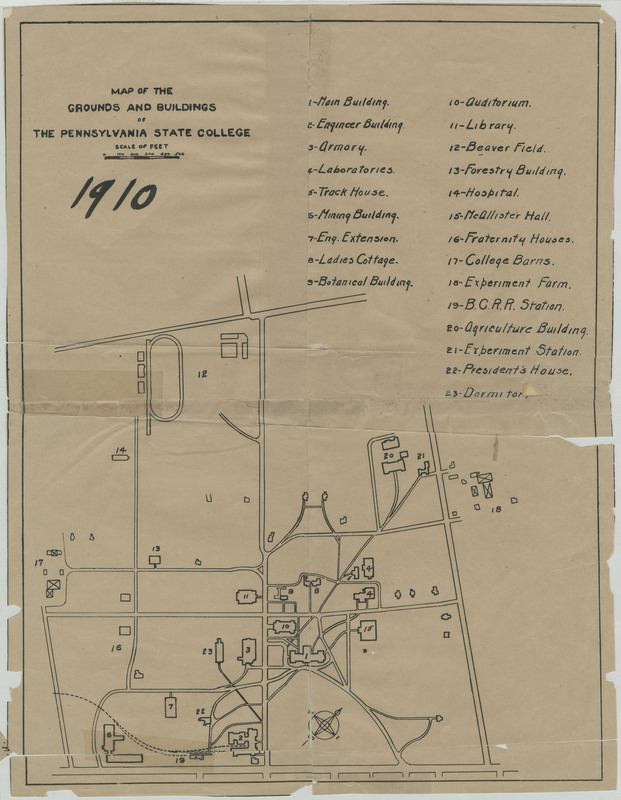 “State College, Centre County, Pennsylvania, Oct. 1938,” by Sanborn Map Company, Sanborn fire insurance maps, Pennsylvania [1884-1950], Penn State University Libraries. 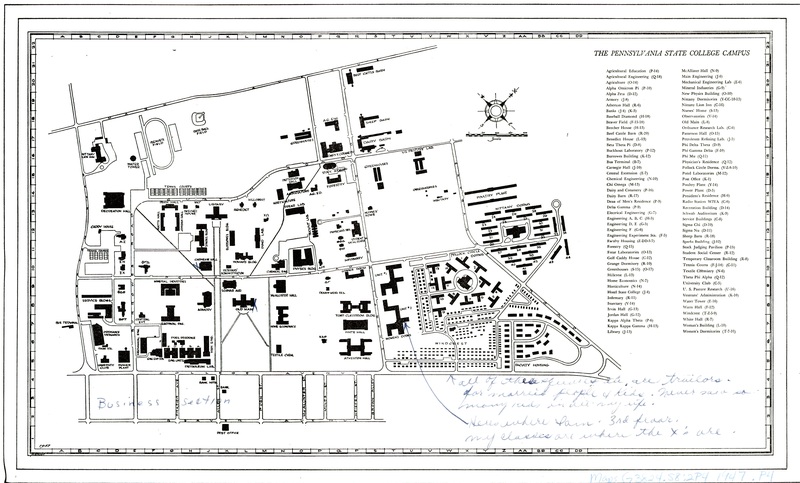 1940: “Pennsylvania State College Campus,” General vertical files, Physical Plant: Maps and Charts, 1940-1949, The Eberly Family Special Collections Library, Pennsylvania State University Libraries. 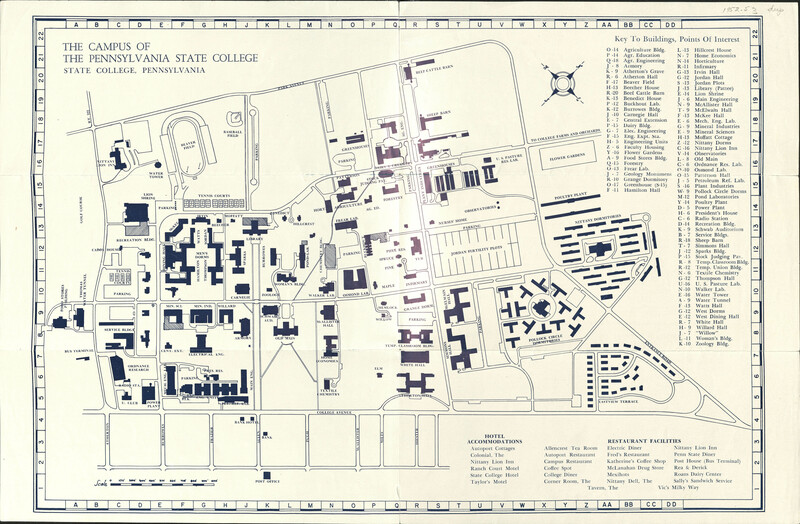 “Pennsylvania State College Campus,” Donald W. Hamer Center for Maps and Geospatial Information, Pennsylvania State University Libraries. 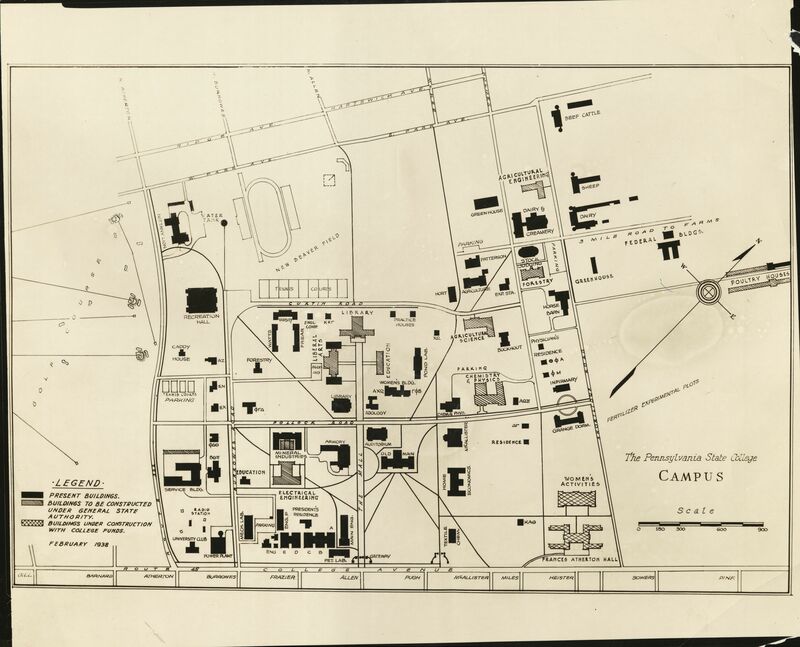 “The Campus of the Pennsylvania State University,” General vertical files, Physical Plant: Maps and Charts, 1940-1949, The Eberly Family Special Collections Library, Pennsylvania State University Libraries. 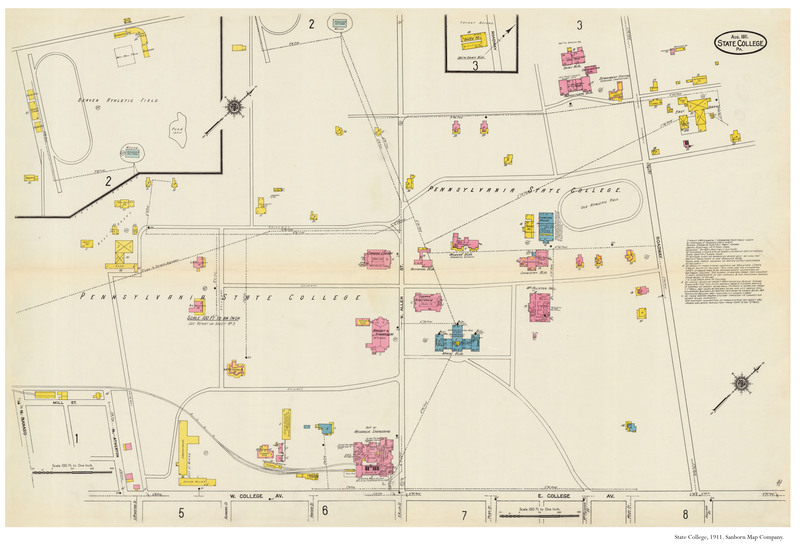 “The Campus of the Pennsylvania State College,” General vertical files, Physical Plant: Maps and Charts, 1950-1959, The Eberly Family Special Collections Library, Pennsylvania State University Libraries. 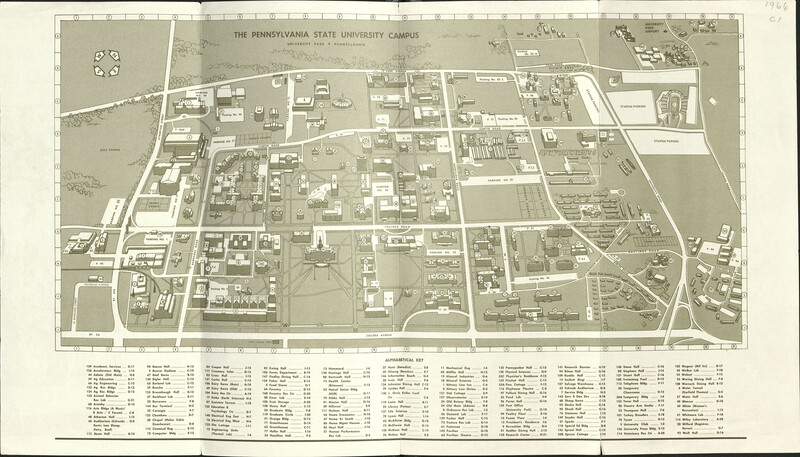 “The Pennsylvania State University Campus,” General vertical files, Physical Plant: Maps and Charts, 1950-1959, The Eberly Family Special Collections Library, Pennsylvania State University Libraries. 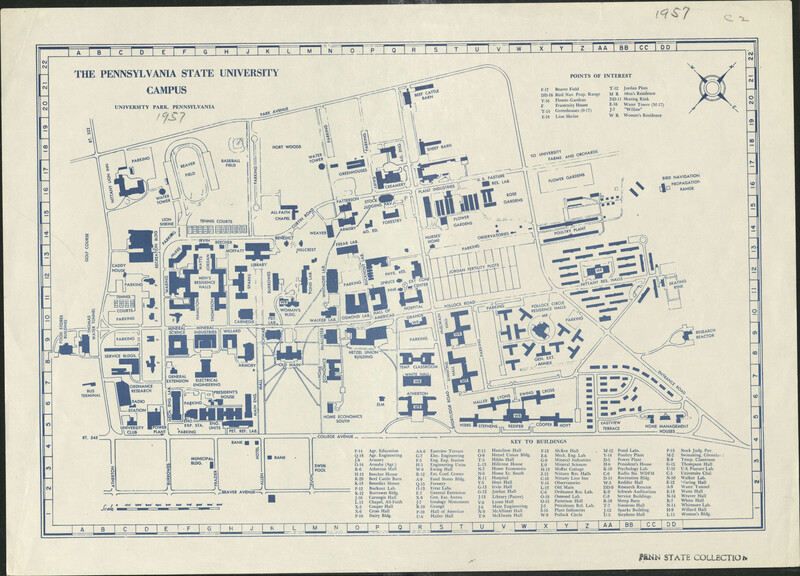 “The Pennsylvania State University Campus,” General vertical files, Physical Plant: Maps and Charts, 1960-1969, The Eberly Family Special Collections Library, Pennsylvania State University Libraries. 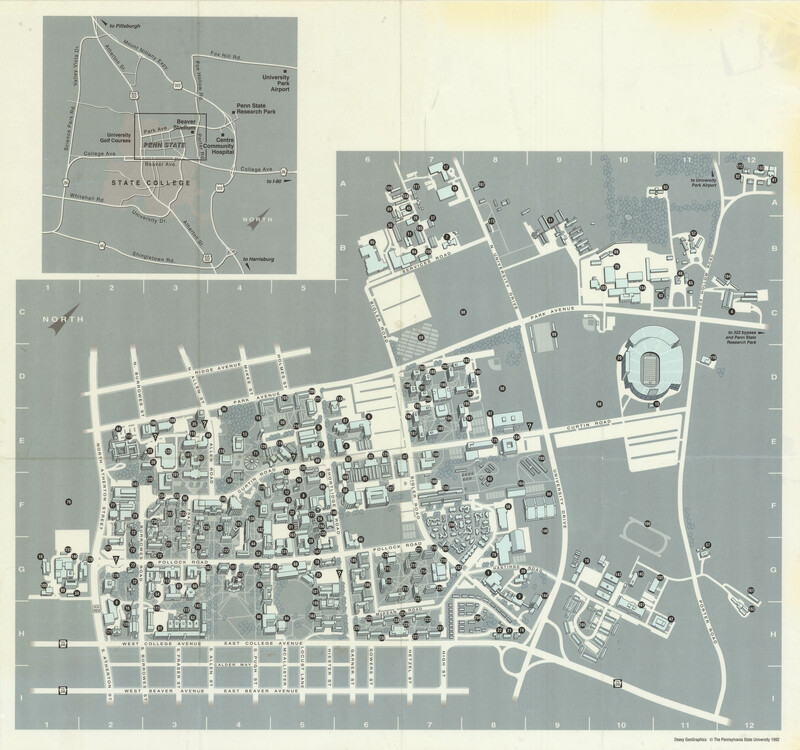 “The Pennsylvania State University, University Park Campus,” General vertical files, Physical Plant: Maps and Charts, 1970-1979, The Eberly Family Special Collections Library, Pennsylvania State University Libraries. 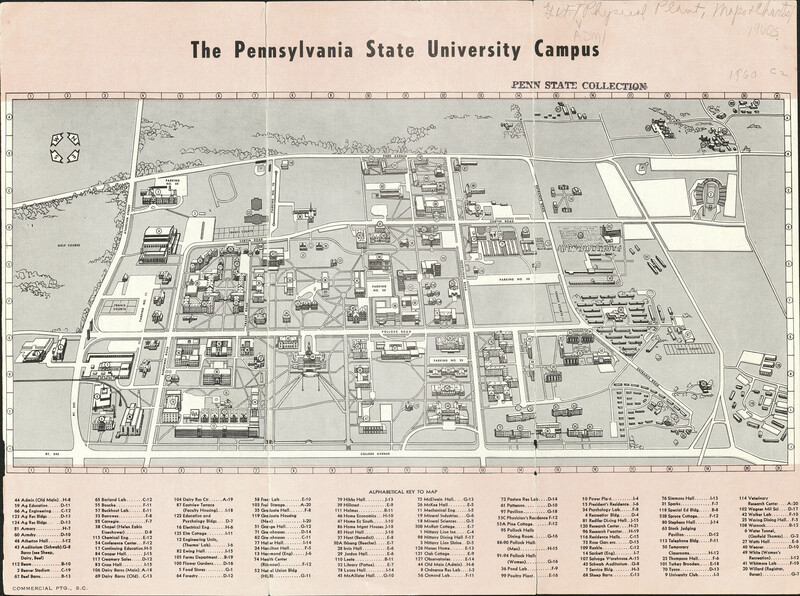 “The Map of the Pennsylvania State University,” Donald W. Hamer Center for Maps and Geospatial Information, Pennsylvania State University Libraries. 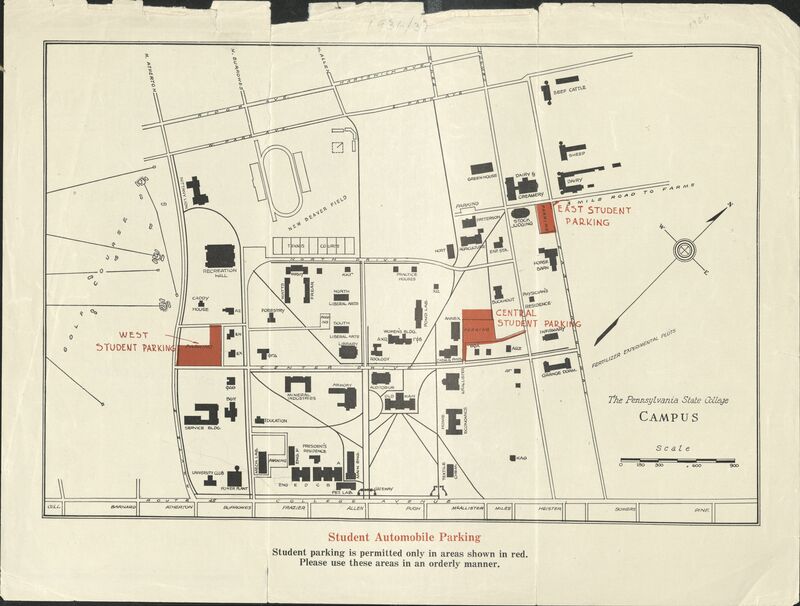 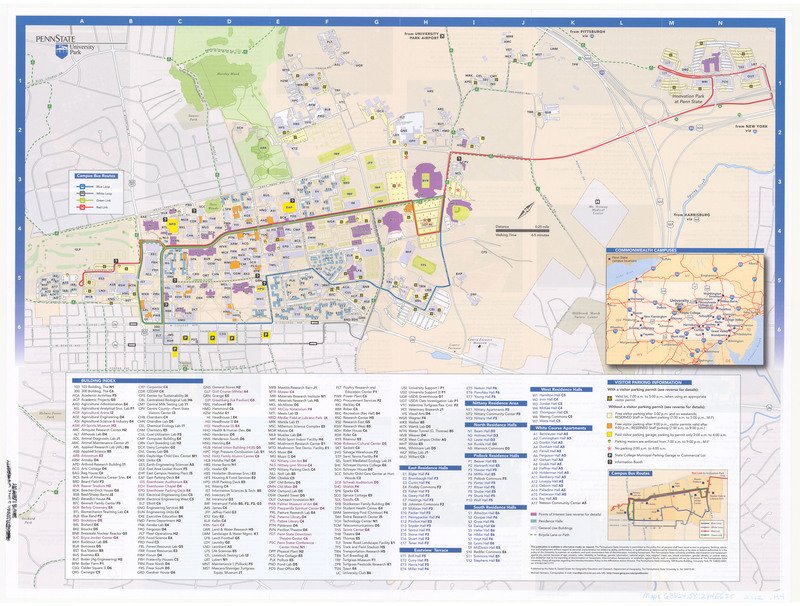 “Campus Map: A Guide to the Penn State University Park Campus,” Donald W. Hamer Center for Maps and Geospatial Information, Pennsylvania State University Libraries. 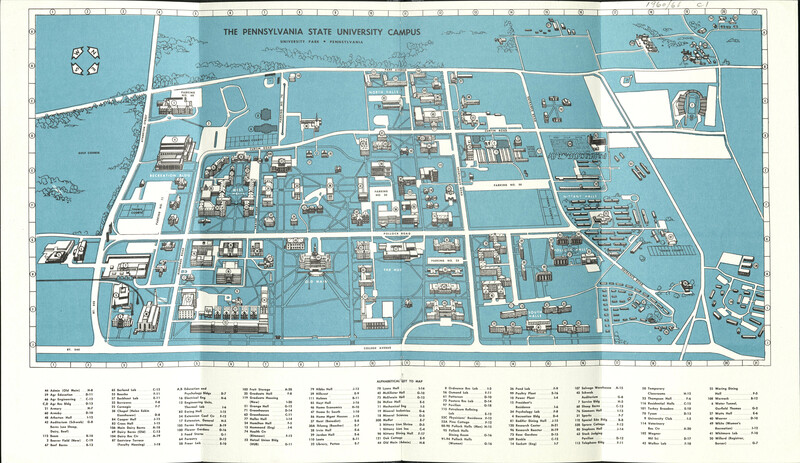 “The Pennsylvania State University: Visitors’ Guide Campus Map,” Donald W. Hamer Center for Maps and Geospatial Information, Pennsylvania State University Libraries. 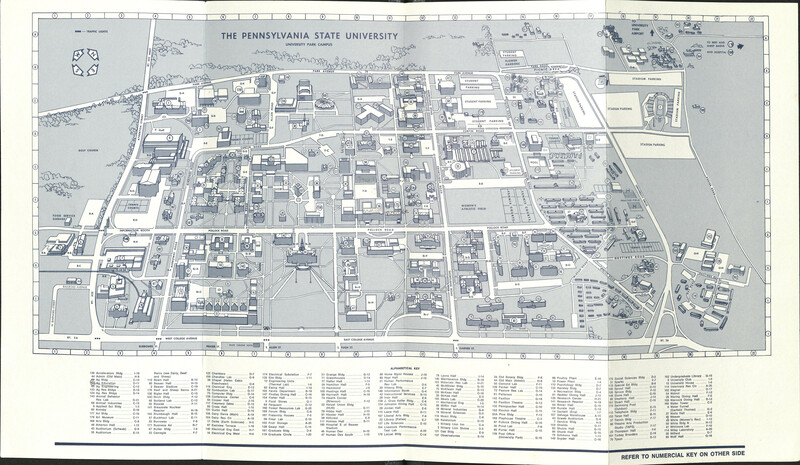 “The Pennsylvania State University: Visitors’ Guide,” Donald W. Hamer Center for Maps and Geospatial Information, Pennsylvania State University Libraries.